What is root canal therapy and what it does in your tooth? Chino Hills Cosmetic Dentist, Cosmetic Dentistry | Dental Care of Chino Hills > Dental Care > What is root canal therapy and what it does in your tooth? Root canal therapy, otherwise known as simply root canal, is a treatment procedure performed by dentists to rescue and restore severely decayed and infected tooth. Dental infection that is left untreated may progress to other parts of the tooth, may reach the pulp of your tooth or the nerve chamber and may eventually develop to tooth abscess. The tooth’s pulp can become inflamed or infected because of deep decay, cracked or broken tooth, dental trauma and repeated dental procedures. Patients with infected tooth pulp may or may not experience acute sever dental pain, swelling on the affected tooth and fever. Dental infections are often treated with antibiotics. But in severe cases where the tooth pulp is infected, root canal therapy is performed. Your dentist will determine whether you need the therapy or not. He/she will look for signs and symptoms indicative that you should undergo root canal therapy. Often times, the dentist performs oral examination and dental x-ray to determine the extent of infection that needs to be treated with this therapy. Root canal treatment procedure may require one or more dental visits to accomplish the treatment. The number of dental visits depends on the difficulty of the procedure the level of comfort of the dentist in performing the procedure. 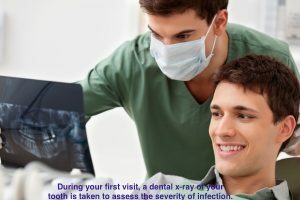 During your first visit, a dental x-ray of your tooth is taken to assess the severity of infection. Then your dentist will numb the area around the tooth with a local anesthesia. A rubber dam is placed around the tooth to keep it dry throughout the procedure. Once numbness sets in, he/she drills a hole at the top of the tooth and a root canal file is inserted to clean out the bacteria and other tissues and shape the tooth’s canals. Once they are cleaned and shaped, the dentist will decide whether to continue the filling procedure of wait for the next dental visit. The decision depends on the degree of infection; your dentist may want to put a medication before sealing the tooth. In this case a temporary filling is placed on the hole in the surface of the tooth to keep out other debris before the next dental visit. In other cases, the filling procedure is done on the same day it was cleaned. During the next visit, a sealer paste and a rubber compound is used to fill the interior of the tooth and a dental filling is used to seal the exterior of the tooth. To complete the restoration process, a crown is placed over the tooth to protect it. This will enable the tooth to bring back its normal function. Sensitivity is an expected side effect after the procedure. You may want to use pain medications to alleviate discomfort. Make sure that tooth has completely healed before using it to chew hard foods such as candies because it might break and you have to repeat the procedure again. If you have experienced problems regarding your root canal-treated teeth, do not hesitate to contact your dentist.